Many people think Frisbee is only a leisurely game to be played outside among friends but for some, Frisbee is a lifelong passion. In the case of Messiah alumnus Chris Schulze ’07, that passion netted him a position as a professional Ultimate Frisbee player for the Philadelphia Phoenix. Schulze grew up near Amherst, Mass. a place where Ultimate Frisbee is beloved by many people. Ultimate is fast-paced and dynamic. The disc can float, providing players with opportunities for diving plays. For Schulze, “Ultimate gives me a chance to fly. There’s nothing quite like chasing down a disc, laying out completely and grabbing it just before it hits the grass.” Another feature which drew Schulze to Ultimate was something called “spirit of the game,” meaning that the game is self-officiated and requires players to be of the highest integrity. When Schulze, a sports and exercise science major, first came to Messiah, he was surprised to find that the College had no official Ultimate Frisbee team. He had started playing with his church’s youth group at the age of 14 and played on a varsity team in high school, so naturally he “was disappointed to realize that the extent of the Ultimate scene [at Messiah] was a few people who got together sporadically to play around campus and intramurals in the spring.” Schulze set out to start the first Ultimate team at Messiah and eventually formed a group of 15 people. This young team traveled to Dickinson College to participate in a 12-team tournament. The Messiah team won and, more importantly, the players enjoyed the experience. With growing support from classmates, Schulze officially started the Messiah Ultimate team in 2004 and the Ultimate group grew from just one co-ed team into men’s A and B teams and a women’s team. Schulze hasn’t forgotten his Messiah Ultimate “family.” In June 2010, he married Andrea (Peters) ’09, who he met through playing Messiah Ultimate. They weren’t the only teammates to marry. “There have been many other marriages to which Messiah Ultimate has been a catalyst,” Schulze says. The time Schulze spent at Messiah was instrumental in preparing him for the future. Schulze said, “At Messiah I learned how to be a leader and learned the importance of engaging in activities that make me feel whole. When I play Ultimate I feel like I am doing what God created me to do.” These lessons were helpful when, more recently, Schulze was given the opportunity to pursue his passion for Ultimate even further. 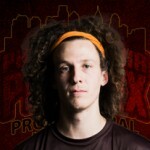 He was contracted by the Philadelphia Phoenix to play on their professional Ultimate team. The experience has been a unique challenge. Schulze mentioned, “The personal and team training that goes along with playing professionally is certainly intense.” But Schulze is not alone at the Philadelphia Phoenix. He has reconnected with several teammates from the Messiah Ultimate team including Jordan Winey ’07, now a professional teammate, and Charlie Hoppes, coach of Messiah’s men’s Ultimate team and assistant coach of the Phoenix. Story by Jeremy Ross ‘15. Photographs courtesy of Chris Schulze. This entry was posted on Tuesday, May 6th, 2014 at 2:34 pm	and is filed under Alumni. You can follow any responses to this entry through the RSS 2.0 feed. Both comments and pings are currently closed.